Ladies and gentlemen. My name is Ingrid Carlqvist and I was born in Sweden in 1960, when the Social Democrats were gonna rule forever and ever and our country was the nicest and safest and most progressed in the world. Now I live in Absurdistan – a country that has the highest figure of reported rapes in the world, hundreds of so called “exclusion areas” where people live outside the Swedish society and with newspapers that hide all these horrible facts to the people. I feel just like Dorothy Gale in The Wizard of Oz – a tornado came and blew me miles and miles away from home and dumped me in a country I don’t know. "Toto, I have a feeling we’re not in Sweden anymore." Like Dorothy I’m searching for a way to find my home, but on my path I only meet lions without courage, scarecrows without brains and tin men without hearts. "We Swedes live in a so infinitely happier situation. The population in our country is homogeneous, not just according to race but also in many other aspects." Now I live in a nation that is not homogenous in any respect. Olof Palme that came after him decided that homogeneous was a bad thing and opened up our borders for people from all over the world. And from right to left the politicians told us that there was no such thing as a Swedish culture, no Swedish traditions worth mentioning and that we Swedes should be grateful that so many people with REAL culture and REAL traditions came to us. "I’ve often had that question, but I can’t think of what Swedish culture is. I think that is what makes us Swedes so envious of immigrants. You have a culture, an identity, something that ties you together. What do we have? We have Midsummer's Eve and such corny things." She also said: The Swedes must integrate into the new Sweden. The old Sweden is not coming back. In this New Sweden we have more reported rapes than any other country in the European Union, according to a study by professor Liz Kelly from England. More than 5 000 rapes or attempted rapes were reported in 2008 (last year it was more than 6 000). In 2010 another study reported that just one country in the world has more rapes than Sweden, and that is Lesotho in South Africa. For every 100 000 inhabitants Lesotho has 92 reported rapes, Sweden has 53, The United States 29, Norway 20 and Denmark 7. In 1990 the authorities counted to 3 exclusion areas in Sweden, suburbs where mostly immigrants live, where very few have a job to go to, almost all of them live by welfare and the children don’t pass their exams. In 2002 they counted to 128 exclusion areas. In 2006 we had 156 and then they stopped counting. In some cities, like Malmo where I live, a third of all inhabitants live in an exclusion area. What did Tage Erlander mean when he said that the Swedish population was homogeneous, not just according to race but also in many other aspects? I think he meant things like norms, values, culture and traditions. A feeling of fellowship. That we all, in the Old Sweden, had a similar view of what a good society is and how we solve conflicts. He KNEW what the Swedish culture was all about, in contrast to Mona Sahlin. In the New Sweden we need armed police officers at our hospitals because rivalling families fight each other in the hospital rooms. They gun each other down in open streets and they rob and beat old people up. The crime rate grows by the minute, but the Swedish politicians and journalists tell us that is has absolutely nothing to do with immigration. The fact that our prisons are full of foreign people is just a coincidence or is explained by socio-economic factors. For many years I was a journalist in the mainstream media. But I was always a bit of a troublemaker, always suspicious of what people said was THE TRUTH. When everybody ran in one direction, I turned around in the other direction to see what was there. In January 2011 something happened to make me lose my last hope about Swedish journalists. I was the vice chairman of The Society of Publicists in Malmo and had invited the Danish journalist Mikael Jalving to talk about his coming book "Absolute Sweden – a Journey in the Country of Silence". One day the chairman phoned me and said: We must cancel Mikael Jalving because he is going to talk at a meeting arranged by a newspaper called National Today. It didn’t matter to him, or to anyone else on the board of this society for journalists that Jalving was going to talk about his book. If he went to that meeting he would be infected by nationalist ideas and probably he would become a Nazi. You see, everyone with a different opinion in Sweden really IS a Nazi! 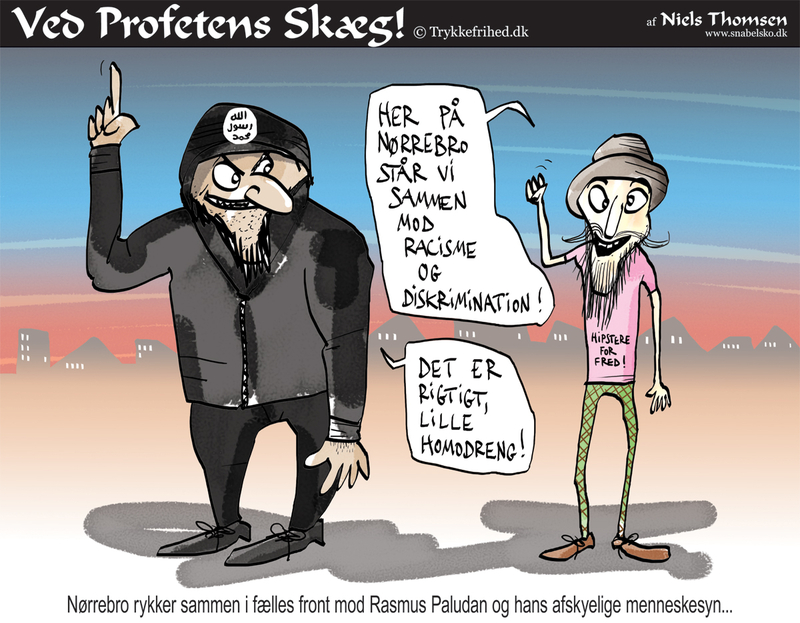 That’s the way it works in the New Sweden, the country I call Absurdistan. The country of silence. I was furious and left the board of that society. That led to my being invited to The Danish Free Press Society to talk about the strange country of Sweden and that led to my founding of The Swedish Free Press Society. That is how Lars Hedegaard and I found each other. But we didn’t settle for running one Free Press Society each, since we both have a solid background as journalists we decided to start a newspaper. A good old, old-fashioned printed newspaper. We decided to call it Dispatch International because our vision is that this newspaper will become worldwide one day. But first we take Manhattan, then we take Berlin. Or rather – first we take Scandinavia and then we take the world! Dispatch will be printed in two versions – one Danish and one Swedish – but all the stories are the same. And on the internet you will be able to read our stories in English and German as well. We will write about politics in our countries and in the world. We will write about all those things that mainstream media have been hiding for so many years now. We will distinguish between news stories and commentaries and the tone will be subdued. We will let the facts talk, the facts that mainstream journalists hide from people. The situation in Sweden is far worse than in Denmark. In Sweden NOBODY talks about immigration problems, the death of the multiculti project or the islamisation/arabisation of Europe. If you do, you will immediately be called a racist, an Islamophobe or a Nazi. That is what I have been called since I founded the Free Press Society in Sweden. My name has been dragged through the dirt in big newspapers like Sydsvenskan, Svenska Dagbladet and even my own union paper, The Journalist. So now I need you all to be my Glinda, the Good Witch of the North, and help me find my home again! I don’t think it will work to tap the heels of my ruby slippers together three times as Dorothy did to wake up in her bedroom in Kansas. But if you support Dispatch by taking a subscription or become a shareholder or just donate money to us, you will take me one step closer to home. To the Sweden that once was, the Sweden I want back.